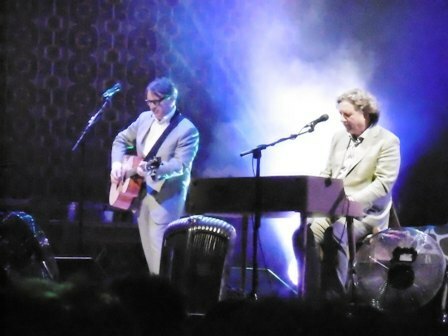 Their tour is dubbed 'The At Odds Couple' but posters in the Town Hall lobby informed us that Chris Difford and Glenn Tilbrook were 'The Odd Couple'. A simple mistake - but the beginning of the show by the duo from Squeeze made me think it could be true. The stage was laid out like an apartment with tables, chairs and a double bed. In the bed were Chris and Glenn and they proceeded to perform the first number, Take Me I'm Yours, wearing pyjamas and slippers. Showing on the big screen at the back was a 40 year old film of the fresh faced Squeeze at the start of their career. 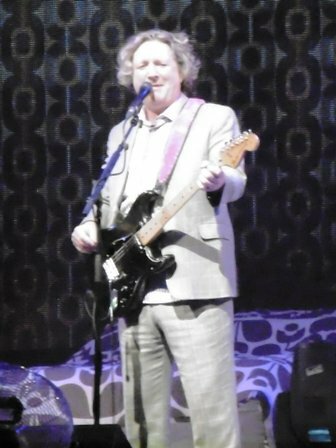 ''If someone had told me then that 40 years later I'd be at Birmingham Town Hall performing in my pyjamas I'd never had believed them,'' joked Chris. Glenn continued the gag by Hoovering the carpet as Chris spoke to the sold out crowd. Normality quickly resumed as the duo donned their normal clothes and proceeded to raid the Squeeze back catalogue. As well as the hits, like Up The Junction, Tempted and Cool For Cats, there were album tracks and obscurities such as Halfway and Annie Get Your Gun. 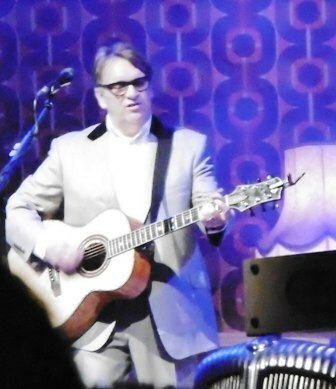 Both musicians were allowed a handful of solo songs. Chris chose Wrecked, Fat as a Fiddle and Cowboys Are My Weakness, while Glenn picked Persephone, Ice Cream and Chat Line Larry. 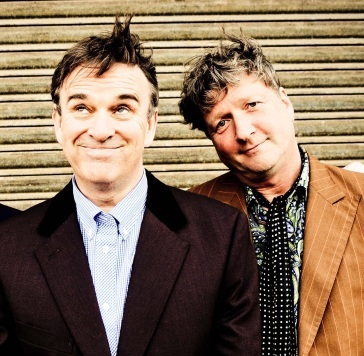 Interestingly, there were two new songs, Beautiful Game and Cradle To The Grave, written for Danny Baker's forthcoming TV show and destined for a new Squeeze album. Some of the songs had their origins explained. We discovered that Cowboys Are My Weakness was written for KD Lang who declined to record it as she considered it a boy's song. Wrecked is about the time Chris and his flatmate stayed indoors all the time, smoking and listening to Tubular Bells. Persephone is about a girl encountered at the Big Chill festival. There was more insights during four Q & A sessions which gave the audience the chance to quiz the stars. To be honest, the questions were better than the answers but how do you respond to 'how come Squeeze's keyboard player Jools Holland got so rich'? Nov 19: Warwick Arts Centre.